Ants entering the weep hole. They are heading to the queen and the nest which is located inside the walls of the home. Bees colonizes inside the weep hole where the hive has built the nest. A red wasp exits the weep hole. Bees are known to build nests inside the cavity wall of your home. Ants entering the weep hole seeking food, warmth, and water. A Bug Out installed on a stone home. The weep holes on stone homes are round. A Bug Out installed on a brick home. The weep holes on brick homes are rectangular. 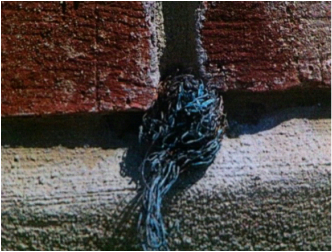 This is an example of a home owner who noticed bugs entering the weep holes and stuffed them with steel wool. The weep holes are not allowed to perform as designed, creating mold to form inside the walls of the home and the condensation escaping caused the steel wool to rust and the outside wall of the home to stain. Ants entering into the home through a weep hole. A different home also used steel wool staining the foundation of the home. A home owner stuffed the weep holes to keep the bugs out with copper mesh which has corroded due to moisture in the weep holes. This is detrimental to the health of your family and the home since mold will now grow in the walls.